2 actives combined to to provide a fast, effective kill! 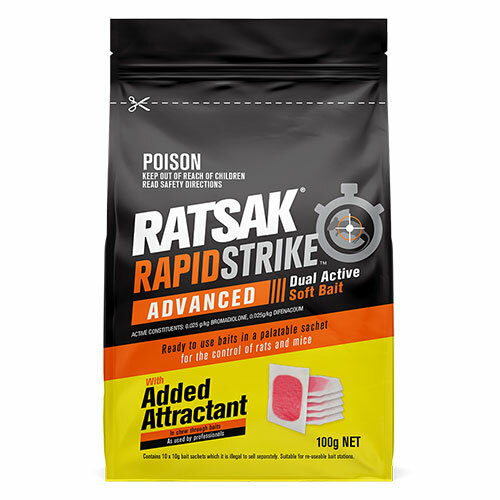 RATSAK® RAPID STRIKE™ ADVANCED DUAL ACTIVE SOFT BAIT is the fastest kill RATSAK® formulation available! One block can kill up to 20 mice or 5 rats! 2 actives - Difenacoum and Bromadiolone combine for super fast, effective kill. Added attractant to entice bait consumption. Soft baits are packed with high quality fats, proteins and aromas, and have a higher moisture content which is highly appealing to rodents. FLUO NP technology reduces bait shyness and allows rodent tracking under ultraviolet light via rodent droppings. Available in 100g and 500g pack sizes. Wear gloves to mask human scent and remove from packaging. The baits are ready to use - do not unwrap individual baits. Rats and mice will chew through the wrapper. Place baits where there are signs of rodent activity, along walls or rafters and in dark, sheltered places. Place baits at 2 to 3m intervals throughout the infested area for mice; and 1 to 3 baits at 5 to 9m intervals for rats. Fix, nail or wire baits in place where appropriate. Alternatively, place bait in suitable containers or use weather resistant bait stations constructed from drain pipes or boxes. Do not allow product or containers get into drains, sewers, streams or ponds. This product is restricted to use in and around buildings (within 2 metres). If poisoning occurs, contact a doctor or Poisons Information Centre. Phone Australia 13 11 26. Vitamin K1 (Phytomenadione) is antidotal. Containers that have held bait should not be used for any other purpose. Store in the closed, original container in a cool dry, place out of the reach of children. Do not store in direct sunlight. Do not place bait on near exposed food or food utensils, food preparation areas or food storage areas. Dispose of empty container and unused or untaken bait by wrapping in paper, placing in plastic bag and putting in garbage.Dispose of carcasses by wrapping in paper, placing in plastic bag and putting in garbage.